Free cancellation only applicable 72 hours before arrival. Starts at 2 PM. Please use the bed and locker that has been allocated (number and letter on your key). Payment is upon arrival for the whole length of the stay in cash or credit cards. City tax is 7 HRK (cca 1 EUR) per person per night and is not included in the price, it will be added and charged on arrival. Check out is 10 AM (the latest), if not, additional night will be charged. All your belongings from rooms & lockers should be removed by 10 AM check out time. If you have early bus/flight and have to check early, please pack your luggage the night before. Make sure to return your key. Lost/non-returned keys will be charged 70 HRK (10 EUR). If you fail to show up on your arrival date, total amount will be charged from your credit card as per cancellation policy. According to law it is forbiden to make any kind of noise on the street after 10 PM, POLICE might penalize you for non respecting the law (up to 2.000 HRK – cca 266 EUR). Take this seriously. Please be quiet between 10 PM to 7 AM in the entire hostel. Respect your room-mates. Food and alcohol are forbidden in the dormitory rooms and reception desk. It is forbidden to smoke within premises. Use of drugs and weapon possession in the hostel is strictly prohibited. Entrance in dormitory rooms is forbidden for persons who are not guests of this hostel. Penalty for violation of this regulation is 50 EUR. It is the guest´s responsibility to ensure that their personal belongings are secure at all times. Hostel accepts no liability for the loss, theft or damage to guest´s property. We recommend to use lockers. It is forbidden to hang your wet clothes in the room. Entrance door is locked automatically after 10 PM, make sure to always take your keys with you! Please turn off AC when leaving the room or when windows are opened. We are located in the part of Dubrovnik which is vibrant during day and calm at night, next to Green market and Ferry port! Choose the first line to the sea! Only a small road, park and a promenade is between us and magnificent blue Adriatic! Hostel Euroadria is a Mediteranean style building from 19.st with stone walls and red roof. We have a 24 hour front desk, offer common social areas, free WiFi and free City maps. Luggage storage is available as well. If guests want, they can book breakfat for 7,50 Euro. Try open air gym in front of our hostel, exercise in green park under the sky where you have all fitness machines you need! Every day fresh local fruits on green market. Game of Thrones and Stars Wars are waiting for you! Discount for all excursions and transfers up to 40%. Bus terminal is 800m from us! Local station is in front of our hostel, bus no. 1A, B, C & 8 drives you to the Center. 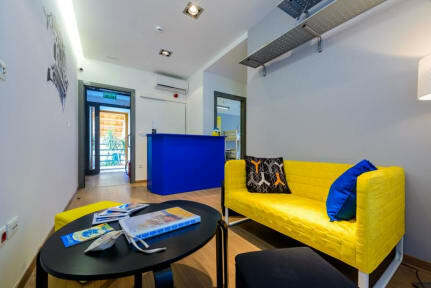 Hostel Euroadria has 3 shared rooms, 2 dormitory rooms with 3 bunk beds for 6 pax and 1 room with 2 bunk beds for 4 pax. Each bed has 2 lookers, one under the bunk bed and one on the wall. Bathroom is shared. Check out before 11:00 at the latest, if not, additional night will be charged. Payment upon arrival by cash, credit cards, debit cards. Payment is upon arrival for the whole length of the stay. Taxes not included - city tax 1.00 EUR per person per night, it will be added and charged on arrival. Please use the bed and locker that has been allocated (number and letter on your key). All your belongings from rooms & lockers should be removed by 11 AM check out time. I was very happy with the hostel, with the staff and the location. It is not in the old town, but it's in the center of Dubrovnik so you can find a lot of cheaper bars and restaurants. I am certain when I return I will stay at the same place. Amaxon place. It was so clean that literally shines! The staff were the most polite and kind people ever. The hostel I so well located, just meters from the port, the bus station, the bus stop, the local food and fish market, an amazing natural reserve, unpopulated beaches with clean water, so transparent that you see the bottom and the fishes wich are plenty. Dubrovnik is also the most secure place for women, you will never see a man saying anything never. A lot of woman walk alone super safe. The bad think in this hostel is that there is no kitchen and you can not preper the food. It is a bit annoying coz the prizes in Dubrovnik are extremely high. Moreover, the hostel have only one shower!!! The localization is not that bad, hostel situated in front of Luka Port also surrendered by many shops and bakeries, 25 min distant by walk to the old town. I enjoy the my stay there. It is very nice place. It's clean and nice, but a bit small. Did not bother me and I loved my stay here. Good beds, lovely staff. Only it was a bit far from old town, but there were plenty busses going. Awesome facilities and staff. There is a nice bar downstairs that keeps open till around 3 am. The patrons of the bar and the hostel both, are superb hosts. Location however is a bit of a disappointment. Although, one could see the promenade out in the front, accessing the hostel itself is a bit of an adventure for a new comer. It's also a bit far from the old town gates. Only stayed here for one night, arrived late and left early, so can't give the best review of this hostel. However the short time I spent there was more than good enough. The location is perfect for the bus station, which is what I wanted, but it's a long way from the old town. Price is very good, beds, lockers and rooms in general are very good as well. It's small and I imagine it wouldn't have the best atmosphere, but if you're just looking for a cheap and good hostel, it's a good choice. Nice little hostel but no kitchen only a kettle but no coffee but over all I liked the place. The staff was great and really helpful with what I wanted to do here and would stay again if I was ever in Dubrovnik again. This hostel is fine- it has everything you could need (shower, bed, linens, comfort, etc) but there is no kitchen. The common area is so tiny and crowded- maybe room for just a couple of people. The staff is nice & the ability to purchase and print bus tickets from the hostel was helpful! It is a bit of a walk to the old city and the sites, but it is near the bus station and walking was not a problem- its a beautiful city!